Prepare batter and bake one 9-inch cake layer, according to package directions. Set cake aside to cool and increase oven temperature to 375°F. Cut parchment paper to fi t a large baking sheet. Cut 9 more pieces. In a large bowl, beat together butter and eggs. Add cookie mixes and fl our, stirring until dough forms. Divide dough into 10 equal portions. Bake, in batches, for 8 to 10 minutes each, or until cookies are lightly golden around edges. Remove from oven and immediately sprinkle with sugar crystals. Cool on pan 1 minute. Remove to wire rack to cool completely (about 20 minutes). Place cake layer on a serving platter or cake stand. Spread entire container of frosting over top and sides of cake. To create tree, place 1 of the largest cookies on cake layer, pressing down gently to adhere. Squeeze a dab of icing in center of cookie. Arrange the other largest cookie on top of the base cookie, alternating points. Repeat stacking, using cookies in descending size and squeezing a dab of icing between each cookie. Reserve one of the smallest cookies for the top. 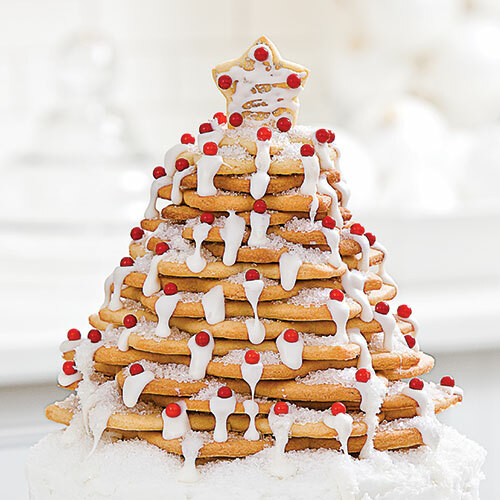 Press a wooden pick into the edge of reserved cookie, then press into center of top of tree so star stands upright. Decorate tree with additional sugar crystals, icing, and candies. Sprinkle cake layer, platter, and tree with edible white glitter to resemble snow. TIP: Bake and decorate a batch of star cookies to swap, but display them next to this show-stopping cake.